Before we get going here, I’d like to be very, very clear: I’m in no way clowning Lil’Jordan Humphrey by calling his name (his first name) the Blackest Name Ever. In fact, I find this to be a compliment and culturally significant. We’ll get back to that. So who is Lil’Jordan Humphrey? He is currently a junior student-athlete at the University of Texas-Austin, where he is a starting wide receiver on the football team. 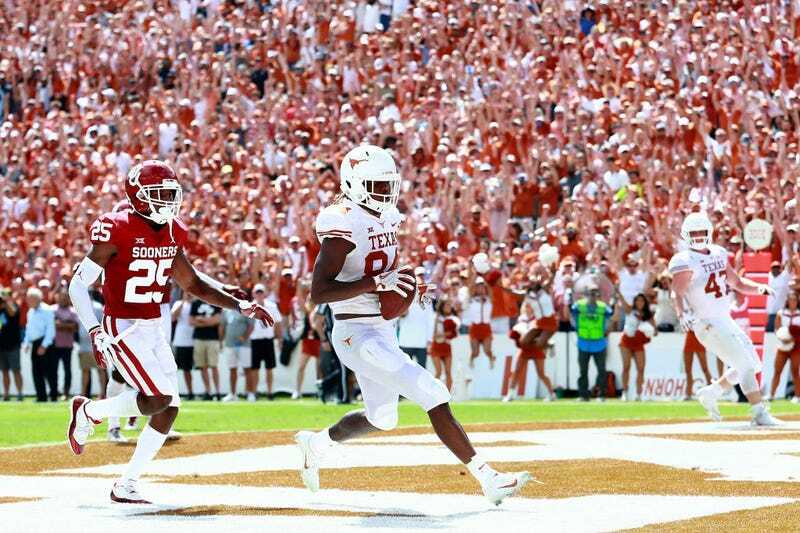 I first came to know Lil’Jordan while watching the highlights of the Red River Showdown/Shootout/Classic, the annual football game between the University of Texas and the University of Oklahoma, this past Saturday in Dallas. Lil’Jordan had a great game, with nine catches for 133 yard and one touchdown. Texas won the game, 48-45. His stats flashed on the screen along with those of the quarterback, and I immediately had to double-take the name on the screen. What was I seeing? Could it be? It could be; I saw two capital letters, an apostrophe and a “Lil.” I had to know if this was legal or if, I believe, NBC Sports had decided to throw in his nickname. My memory couldn’t remember if they ever put former Alabama safety Ha-Ha Clinton-Dix’s actual first name (Ha’Sean; full name, Ha’Sean Treshon Clinton-Dix, which might actually be a top 5 blackest name ever contender) on screen. Lil’Jordan Humphrey’s name is somewhat of a contradiction. At 6-foot-4-inches, 222 pounds, he is not what most would call “little,” but as a compromise for his older brother—who wanted him to be named ‘Michael’ for Michael Jordan—his mother went with “Lil’Jordan ... Humphrey started playing football when he was 4 years old ... was a running back his entire career but is now playing receiver at Texas. A few years back, VSB did a Blackest Name Tournament and it came down to Va’Shaundya Karlette Nelson (real name of Shaunie O’Neal) versus D’Brickashaw Montgomery Ferguson, and Shaunie won. Those middle names really set them apart. D’Brickashaw is a name that strives for greatness in the Black Naming Arts space, but Va’Shaundya goes the extra mile. Lil’Jordan competes in this tradition and his middle name furthers the cultural relevance and significance of his name. His full name? According to several articles, Lil’Jordan has embraced his name and what else could he do? He was a star football standout in Texas, is 6 feet 4 inches and made it to the state’s flagship football program at the University of Texas. He’s doing the damn thing like beavers. I’m sure that other people know folks with names that perhaps rival the name Lil’Jordan. The argument could be made for both D’Brickashaw and Va’Shaundya. According to my Facebook feed, somebody knows a person named Lil’Harold and there’s a woman named Jodeci out there in these streets. The Black Naming Arts is rich with tradition and creativity. But any time you have a legal first name that could substitute as your actual rap name and nobody would notice, when people writing checks to you with your rap name don’t even realize they’re putting your actual name on the check (a struggle I have since Panama Jackson is not my real name), you’ve achieved levels of blackness that many of us can only aspire to. Lil’Jordan Humphrey, I salute you and your name. I will now be rooting for you and your on-field exploits in the realm of ball catchin’ for Texas. It will forever be Roll Tide ‘round my way, but as long as you’re on the field, black culture is present. To Lil’Jordan Maleak Humphrey, current holder of the Blackest Name Ever (until one of you shows up in the comments with a blacker one...I need receipts).